Tymal Mills has been told to concentrate on Twenty20 cricket for the next few weeks - which could be bad news for Sussex Sharks’ South Group rivals. 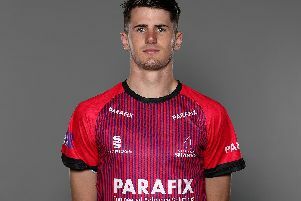 Mills, who joined Sussex during the winter from Essex, was being touted as a potential secret weapon for England in the forthcoming Ashes battle at the start of the season. But a recurring back problem, which first surfaced when Sussex beat Worcestershire in the LV County Championship a month ago, means the 22-year-old left-armer will have a strictly limited workload over the next few weeks. His body isn’t capable of getting through a four-day game at the moment so instead Mills is going to exclusively concentrate on the NatWest T20 Blast at least until July. He made his Sussex debut in the competition on Sunday and even off a shortened run-up managed career-best figures of 3 for 30 as the Sharks bounced back from their opening-round defeat to Kent with victory over Gloucestershire. Mills said: “If you had told me ten days before that I would be playing against Gloucestershire I would have laughed. I was taking medication but still struggling with my back. “I had hardly done anything for the previous four weeks so to come in and help the team win was really pleasing. Mills is one of several injuries to the Sussex seam attack that has disrupted the early weeks of the campaign, although the casualty list is slowing easing. Ajmal Shahzad should be fit for the trip to Taunton after injuring his bicep last week and James Anyon made a low-key second-team comeback earlier this week after lengthy knee problems. Left-armer Lewis Hatchett is also stepping up his recovery after injury. Sussex have never won at Taunton in T20 in two previous meetings and will need to show the ruthlessness evident on Sunday, according to star batsman Mahela Jaywaradene.